Sabal Trail strikes back, claiming trespassing on your property for surveying isn’t a taking of your property rights, and pretending that wouldn’t lead to taking of property rights through eminent domain. 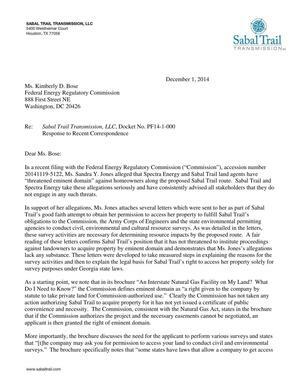 Filed with FERC 1 December 2014 as Sabal Trail Transmission, LLC submits Response to Recent Correspondence under PF14-1. A Colquitt County resident spelled out a series of eminent domain threats to her, plus the background of the infamous Stewart County eminent domain ruling Sabal Trail has used to threaten landowners in other counties. Ms. Grover may be right that surveyors have not threatened eminent domain, but Spectra Energy and Sabal Trail land agents certainly have. In the second letter I received from this company dated September 16, 2013 (see attachments) requesting my signature for permission to survey my two tracts of land, the use of Georgia statute O.C.G.A. 22-3-88 was threatened.